I’ve been MIA for quite some time, and for that I apologize if anybody has noticed… (Sorry, Aimee!?) My life has been on such a bizarre roller coaster for the past while that I have failed to do a great many thing, but especially one of the things that have recently taken so much enjoyment in, cooking and sharing what I’ve cooked on my blog. For Christmas I received some lovely baking sheets, a hand mixer, and a cover for my cast iron skillet which I really hope to get good use out of soon. Since my day-to-day has been so kooky lately, I’ve left them all packed up for the time being, but as soon as I break them out, I’m sure that I’ll make good use of them. Arepas haven’t been on my radar all that long. I won’t lie I wish that I said I’d wanted to make them for a really long time, and finally remembered to buy myself some masa harina, but. Not true. I live in a part of the city right now that has a high density of hispanic foods – restaurants, most of the corner stores sell primarily Goya products, and then a few other items, and Market Basket (the place I both love to shop and curse for being so crazy busy all the time) has aisles and aisles of bodia and Goya items. 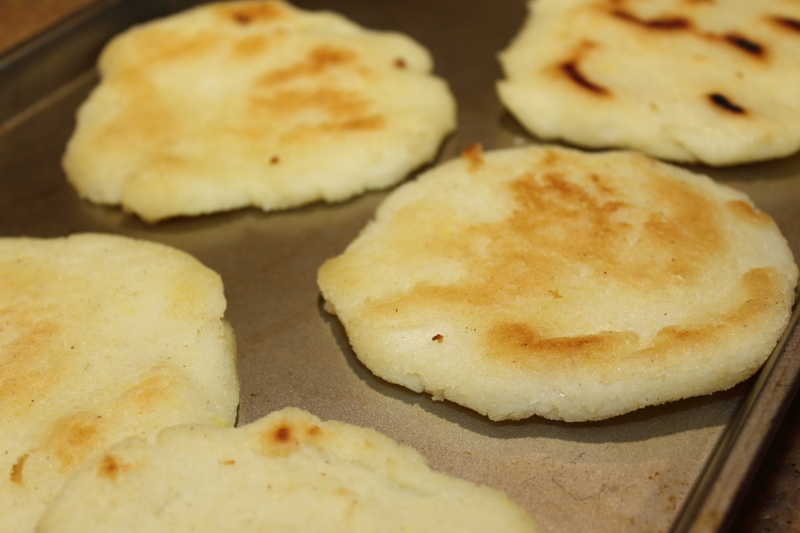 When I finally found myself some PAN, I decided I’d give this whole arepas things a whirl. 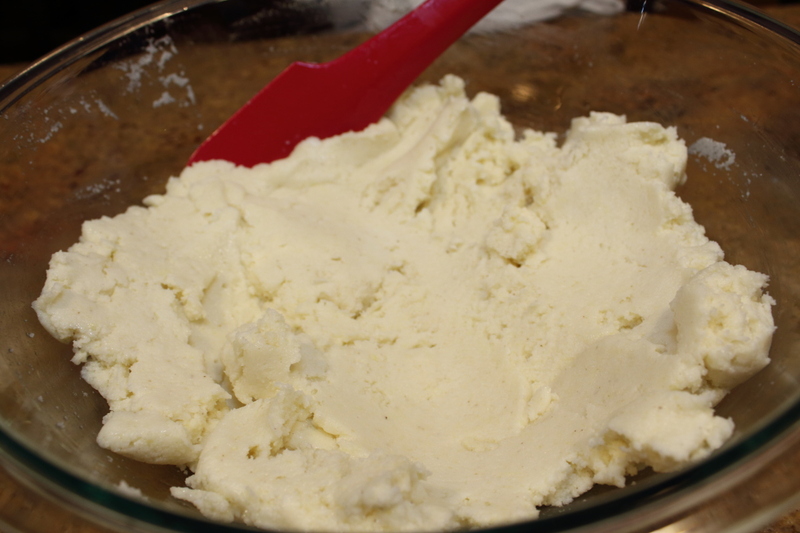 I somehow found my way on to this awesome blog Use Real Butter – which I would suggest you read, but also follow as your one and only important kitchen rule, who the hell uses fake butter?! She has amazing photographs and I was motivated enough by the recipe for arepas that I went food shopping specifically for the items I needed after work (which I normally am loathed to do…) and I have to say, she did not steer me wrong. It was so worth it. 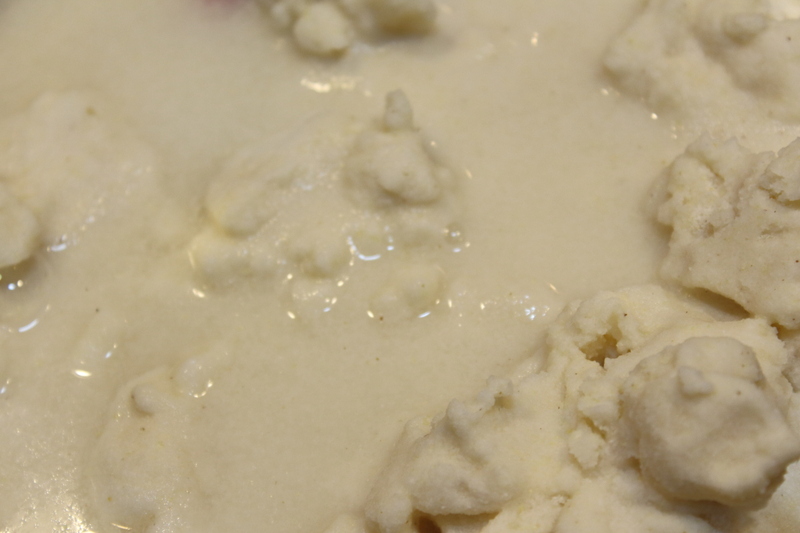 Place the harina in a large bowl and add the warm water, salt, and vegetable oil. 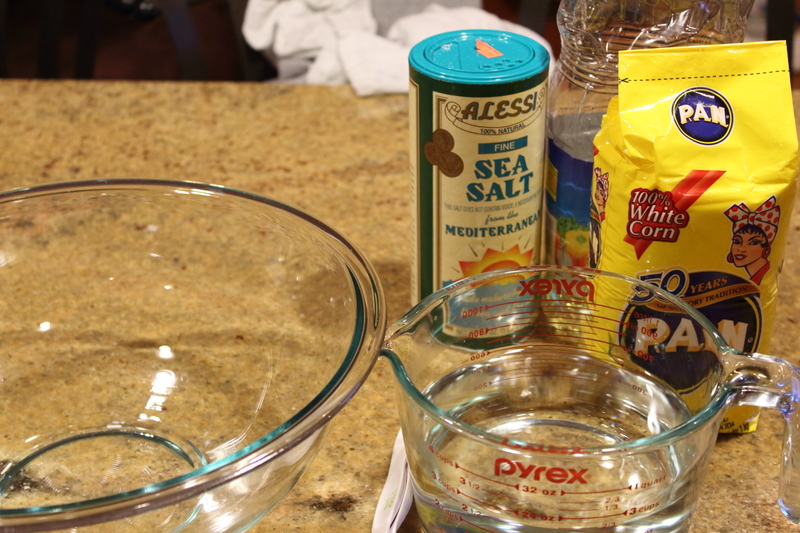 Fold the mixture until combined. Set the dough aside for at least ten minutes. The longer, the better. In this time you can prepare your guasacaca – see below. When the dough has sat for it’s ten minutes or more, mix it together with your hands and smoosh any or all lumps between your fingers. Make sure it is uniformly mixed. 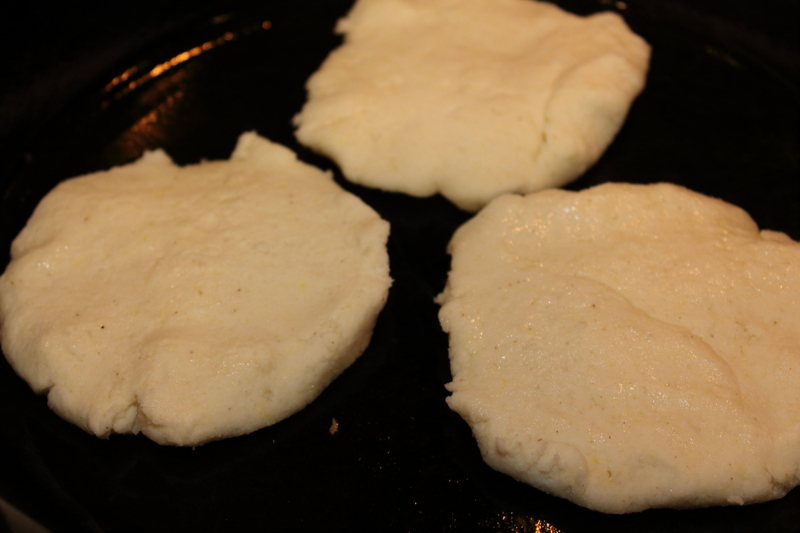 Begin to form patties approximately 1/2-inch thick and roughly 4-5 inches in diameter. Try to make them as even (thickness wise…) and try to make sure they have as few cracks as possible. Use a paper towel to coat your cast iron skillet. Do not use a non-stick pan, use a medium-high heat. Try not to crowd them as you cook them – I have a 12″ skillet and could only cook 3 at a time. Let sit for 5 to 10 minutes until you hear them start to crackle and brown. Peek underneath for doneness – they want to be a light golden, flip them over. Cook for another 5-10 minutes and use a flipper to check to make sure the bottom is evenly cooked. 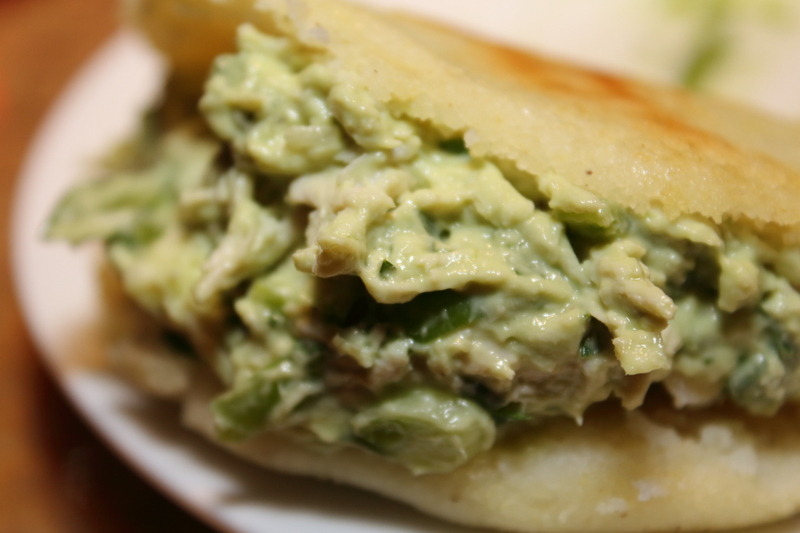 When you tap the arepa it should have a springy texture. If you make them in advance keep them warm in an oven around 200 degrees until your fillings are ready. I love me some jalapenos. They are such a great little bite to this guasacaca (aka avacado salsa, aka the most amazing thing you will ever have the chance to taste) and though you will be tempted to eat this stuff with a spoon – wait until you’ve got some arepas, then save the leftovers for when you need a chip and dip. Oh my god, I was an instant convert. 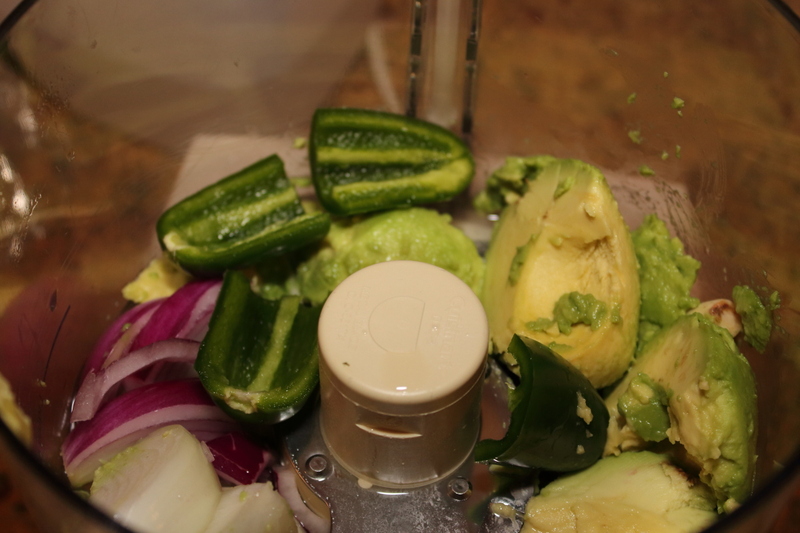 Place the onion, avocado, vinegar, garlic, and jalapeño in a blender (or food processor) and purée until smooth. 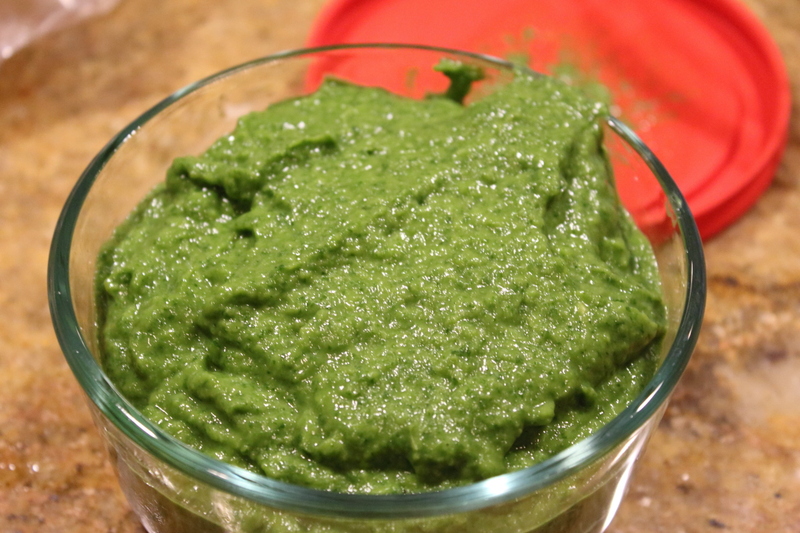 Add the parsley and cilantro and purée until smooth. If it is too dry and won’t blend, add more vinegar and push it toward the blade with a spoon or a spatula between pulses. Add salt to taste and then add the oil last. It’s beautiful, bright green, and so unbelievably wonderful. I literally ate it three days in a row and had ZERO problem doing so – on arepas, tacos, and then chips along side some burritos. Awesome. I also made reina pepiada arepas which are a chicken salad filling which is named in honor of Susana Duijm, Miss World in 1955 and a popular Venezuelan celebrity. I was a little standoffish about something that involved as much mayonaise as this recipe calls for, but I was willing to give it a try. I think it’s healthy to push your comfort level a little bit now and again with food. Clean chicken, remove visible fat, place in a medium saucepan with the onion and cover with cold water by about an inch of water. Add 1/2 teaspoon of salt, 1/4 teaspoon pepper and simmer uintil cooked all the way through, which will take about 15 minutes. 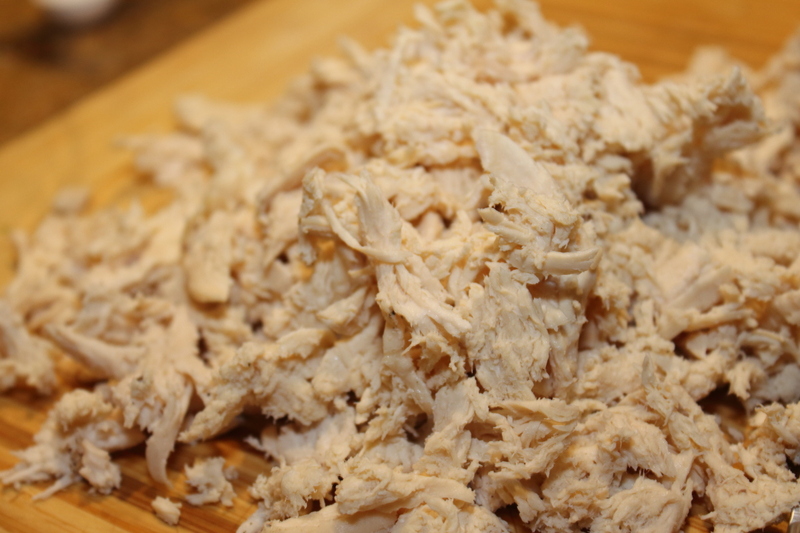 Remove from water when fully cooked and cool completely – tear chicken into bitesized shreds. In a medium prep bowl, mash up avocado in mayo and vinegar until you have removed all the lumps – I used a large dinner fork to smush this together. 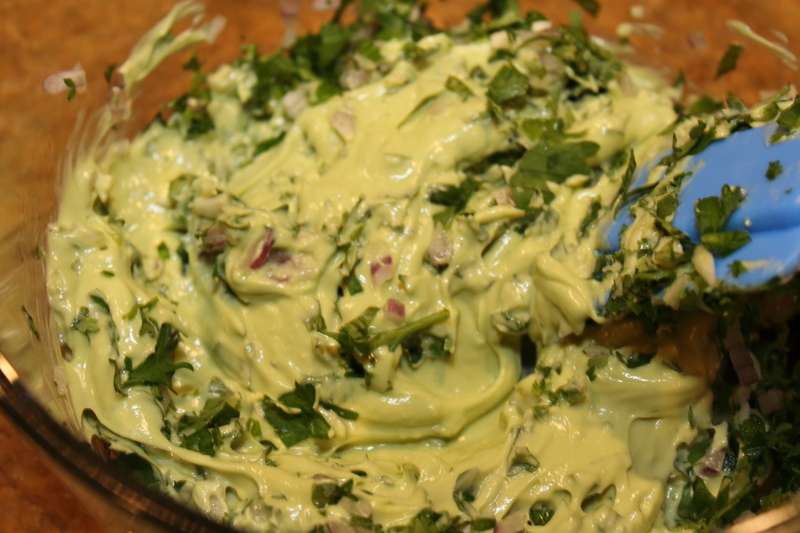 Mix in the cilantro, parsley, jalapeno, and garlic. Then add the chicken, red onion, scallion and mix until combined. Taste and add vinegar if needed to give it a bit of a tangy taste – you want tang, not sour. Cover and refrigerate until ready to serve. Cut the arepa almost in half, scoop out a little bit of the insides and fill with whatever your filling/topping choices are and enjoy! YAY!! 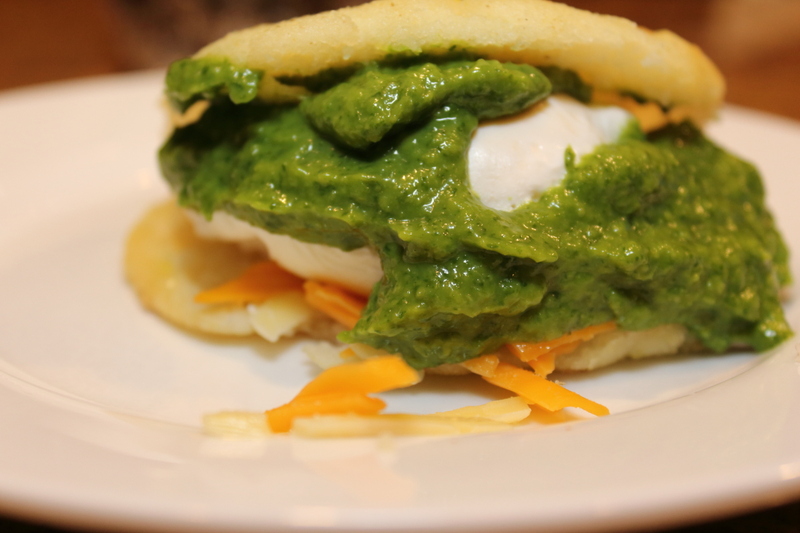 You’re back and I love this recipe, I have never made arepas but sure love eating them, making this for sure. Is PAN the brand name for the harina? I have to find it, I usually trust word on the street. This is wonderful, saved to evernote and will search out the PAN!! So glad you are back and look forward to more. I’m so glad to be back! We are (hopefully hopefully) going to be done moving apartments by the end of the week and life will be less crazy and allow for blogging, regularly! PAN is a brand name. It’s in a yellow plastic bag. I found it (everywhere in my ever so recent “old” neighborhood) at Shaws, next to tortillas in the Goya section. I have to be able to find it here, going to the store tomorrow, there is a street truck food vendor at the Brooklyn Flea (spring thru fall only) that makes homemade arepas to order, they are heavenly and every time I go to the flea its the first food truck I visit. I am so excited to see this recipe. i love the filling and toppings too! I hope to make this regularly, so I can experiment with different fillings. I’ve literally never had them before, I should go find a restaurant that sells them (or food truck) so I have something “legit” to compare mine to. What are the fillings you get from the Brooklyn Flea food truck?